China Merchants Heavy Industry (Jiangsu) Co. Ltd is close to delivering the first of two sister semisubmersibles to offshore operator OOS International. The Shanghai shipyard plans to launch the debutante, OOS Serooskerke, in South Korea later this year, while her sister, OOS Walcheren, is earmarked for delivery in 2019. The twins will primarily be used to undertake heavy-lift and construction duties at allocated offshore wind farm sites, as well as to provide accommodation to the technicians and engineers charged with these tasks. OOS Serooskerke will feature an overall length of 137.75m, a breadth of 81m and a moulded depth of 12m. The semisub will draw 11.3m when in transit, 20m when undertaking on-site construction work and between 22-26.4m when undertaking heavy lift activities. Lightship weight has been calculated as 37,800tonnes. OOS Serooskerke’s design also encapsulates 3,800m² of deck space, strengthened to 15tonnes per m², and a 26m-diameter helideck. 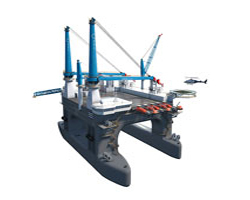 On deck, a pair of active heave-compensated Huisman heavy lift cranes enables a combined maximum lifting capacity of 4,400tonnes, and can perform subsea operations at depths down to 3,300m. The vessel is also equipped with two Huisman service cranes, each rated 36tonnes at 22m outreach. For safe personnel transfers, OOS Serooskerke also features a telescopic, hydraulic walk-to-work gangway, supplied by SMST. Kongsberg Maritime is supplying each vessel’s power and management system and DP3 station, as well as all electrical, telecommunications and integrated control systems. Each semisub will be powered by eight 4MW STX 8L32/40 engines, while six 3.8MW fixed-pitch azimuth thrusters, supplied by Thrustmaster, will be mounted on the vessel’s bottom. This set-up should guarantee a transit speed of approximately 11knots. Meanwhile, CMR Group will furnish the duo with more than 140 offshore-resilient CCTV cameras, thus creating, CMR Group says, “one of the largest CCTV systems of its type” aboard each ship. OOS Serooskerke will feature 750 beds, spread across 90 single cabins, 318 double cabins and six four-man cabins, as will her sister. Each vessel’s occupants have access to 10 150-man-capacity lifeboats. When it comes to cargo, each semisub can carry approximately 2.83 million litres of fuel oil, 1.6 million litres of potable water and 77,500litres of lube oil. The vessels will be classed by ABS, and are expected to feature the notations ✠A1, Column Stabilized Unit, ✠ACCU, ✠AMS, ✠DPS3 EHS-P, Accommodation Service, BWT+, Construction & Maintenance Service and Crane Service, among others.